The queXML PDF Export function allows you to export the current survey in to a structured PDF file that is suitable for being processed using Optical Mark Recognition (OMR) software such as queXF. 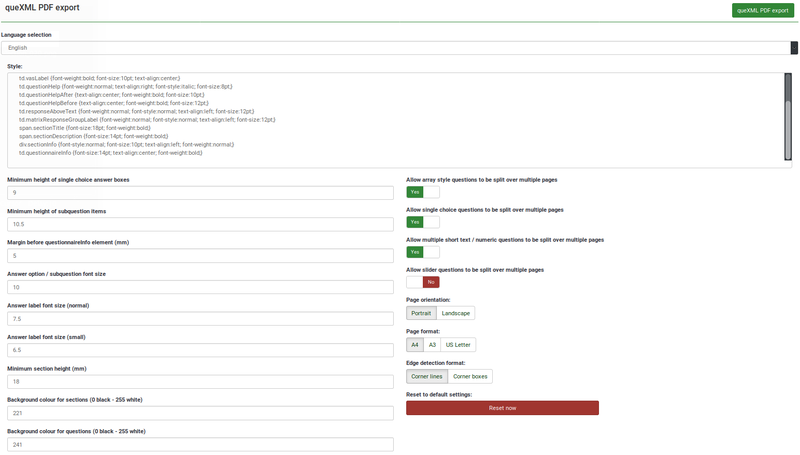 Included in the exported ZIP file is the survey in PDF form, a banding XML file (this describes the location of fields on the paper form), a style XML file (describes the settings used to produce the PDF file), and a queXML file (a structured description of the questionnaire structure). The settings presented on this page are the defaults of the queXML PDF export software. These can be altered to produce a different looking paper questionnaire. If the survey has been translated into multiple languages - you can choose the language for export here. 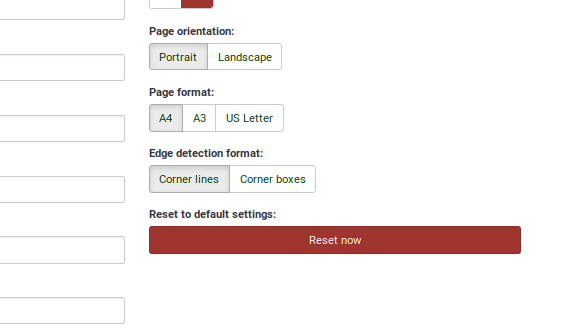 Apply styling to elements on the paper form using CSS. If you have arrays with many subquestions in your survey, this will allow for the array to be split over multiple pages. This avoids having pages with very long questions or too much white space on a page. An arrow will appear at the bottom of the page to indicate the question continues on the next page. Single choice questions such as "radio" style questions can be allowed to split over multiple pages. Useful if you have questions with a long list of possible responses. An arrow will appear at the bottom of the page to indicate the question continues on the next page. Where multiple short text or multiple numeric question types are used - allow their subquestions to appear split over multiple pages (an arrow will appear at the bottom of the page to indicate the question continues on the next page). Slider questions present as Visual Analog Scale (VAS) items in queXML PDF pages. This will allow for a list of sliders to be split over multiple pages. An arrow will appear at the bottom of the page to indicate the question continues on the next page. This sets the minimum height in millimetres of each response item to a single choice (e.g., radio) question. Set this value lower to fit more questions on a page. The minimum height in millimetres of sub questions in an array style question. Set this value lower to fit more sub question items in an array style question. Please be wary that setting this too low may cut the end from long sub question text items. The questionnaireInfo element is the "Welcome" text or "End text" of the survey. This setting sets the margin in millimetres before the text is displayed. The font size in points of answer options or sub question text. The font size in points of answer labels when displayed in subquestions. The font size in points of answer labels when displayed in subquestions where the used long words that cannot fit in the area are provided without being split. 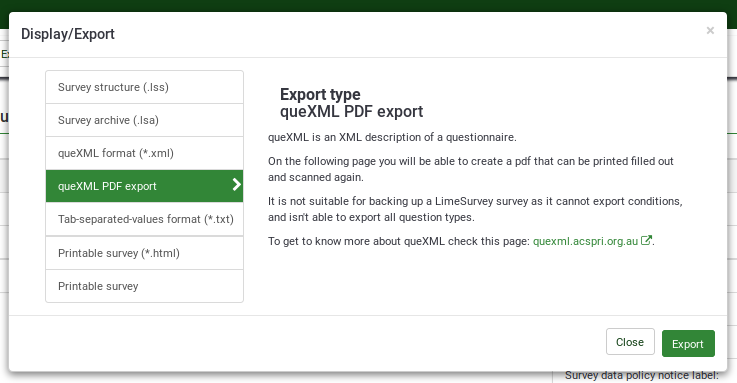 Each group in a LimeSurvey survey appears as a new section in the queXML PDF document. This setting sets the minimum height in millimetres of the heading for the new section. The amount of greyness behind a section heading. The amount of greyness behind questions. Good form design suggests having a light grey background to avoid eye strain and to make the areas for responses clearly defined (the areas for responses are always white). Portrait or landscape orientation for the paper questionnaire. The size of the paper to use (A4, A3, US Letter). What edge style to be used on the page to allow for alignment when scanned. Clicking on the "queXML PDF export" button will generate a ZIP archive containing the PDF questionnaire and associated files. This page was last edited on 21 December 2018, at 12:26.